In today’s business world, making training ‘stick’ is extremely important. How many times have we encountered organizations that, despite having the best intentions, fail to ensure that training of new behaviors is adequately reinforced and monitored to bring about an acceptable return on investment? In today’s segment, we look at how one of Canada’s most iconic companies takes on the challenge of making training stick – how to enable training to lead to improved performance in their organization. Jeff Adams, Managing Director of Continuous Improvement, at Canadian Pacific (CP) recently answered questions about his company’s approach to ensuring that CP Lean Blackbelts properly utilize their new skills to execute continuous improvement in the workplace*. LEAN SENSEI: What do you expect from a Lean Blackbelt once they have completed their training? JA: When we send someone through the Lean Sensei Blackbelt program, our intention is that the individual become a practitioner and coach in CP – that is their full-time role. This role is a significant investment, both in time and resources. And the cornerstone of that role as coach and facilitator is the Lean Sensei Blackbelt program. LEAN SENSEI: What lean behaviours do you expect to see? JA: We need to see those lean principles into action. When the individual comes back to CP, it’s a different environment; it’s their regular, working environment. Going to a training program is what we call an antecedent. So, you’ve gone to a training program, you now understand the content, and we wouldn’t have sent you if you weren’t highly motivated to utilize and execute that content. Simply going to a training program, however, doesn’t guarantee that you will go on to use what you’ve learned and practice it properly and fully. Training does not guarantee any change in behavior. Training, like a traffic sign or job instruction, is what we call an “antecedent” in that it precedes the desired behavior. If you look at the impact of antecedents on behavior, just because someone knows what to do, just because they are motivated to do it, does not necessarily mean that they will end up executing the behavior. It’s been well proven that antecedents – in this case, training – only has about a 20% influence on whether they execute the behavior or not. What actually determines behavior and repeating behavior are the consequences from performing that behavior – consequences influence 80% of behavior. LEAN SENSEI: Can you tell us about CP’s approach to ensuring that a Lean Blackbelt actually continues to demonstrate the desired behaviors for continuous improvement after their training? JA: Many of us have been through programs, and have been sent for training in different companies and in different roles. People are often sent for training but come back to an environment that doesn’t support that new content. 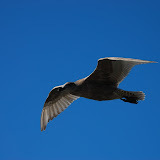 At CP we are very focused on reinforcing that new content and reinforcing those behaviors. My Directors and I developed a behaviour and results assessment that we use to evaluate a Blackbelt’s performance and on-the-job compliance. We are looking for demonstrated, sustained performance in these new behaviours and concepts back at CP. When they demonstrate the behavior properly, we give them positive reinforcement by pin-pointing exactly what that behaviour was and why it’s important. When they don’t, we provide constructive feedback by identifying the undesired behaviour with the person, pin-pointing the desired behaviour, how to meet the requirement, to get into a routine and internalize a sustained habit. A different way to describe it would be that LSI certifies the person has fully met the knowledge and skill requirements, then we at CP certify the person who is actually performing at that level back in their full-time role. While LSI does a terrific job in Lean Blackbelt hands-on training, LSI can’t be present back at the day-to-day job to ensure those skills are utilized and continue to build – that’s my role. LEAN SENSEI: What happens once someone has consistently demonstrated the behaviours enough to be considered “certified” as a CP Lean Blackbelt? JA: First I must mention that it takes about six months for someone to successfully demonstrate that they have internalized and sustained the behaviours. That does include executing and facilitating lean philosophy and tools, but it also includes specific behavioral psychology and communications training and with follow-up performance assessments as well. At that point, we plan an event to recognize that accomplishment with their peers and senior management, and award them with two very important items. The first item is a lovely professionally-framed certificate naming the person, describing the accomplishment and it’s meaning to the company. Each certificate is personally signed by the President of Canadian Pacific Railway. So there is a very definite message from top management about the importance of that accomplishment and the role as a CP Lean Blackbelt. The second item we give them is a game figurine, unique to that individual. It’s professionally mounted inside a display case with their name and “CP Lean Blackbelt” engraved, and is accompanied by a description of that figurine’s name and personal attributes (with translation from Japanese provided by LSI). JA: I wanted something that would reinforce the experience of the Blackbelt training through Lean Sensei and, in particular, the experience of Japan. I consider the shop floor level visit of Japan to be the single most important module in all of the training – it has a profound impact on the Blackbelt’s outlook and attitude. So, for that reason, I wanted something that was representative of that experience. What is unique about the figurines is the dozens of characters and that they are not available in North America. By selecting a figurine with a certain character, we could somehow connect the character to the individual receiving that particular figurine. And while the figurines have low tangible value, they have high emotional value – because you can’t get them in here and you can only earn one in this way. LEAN SENSEI: Are you the one who decides which character is matched with a certain Lean Blackbelt? JA: No, it’s not up to me – a small team of us sits down to determine which game character reminds us of the CP Lean Blackbelt candidate. And the choice must be unique for that person – no two people are awarded the same figurine. 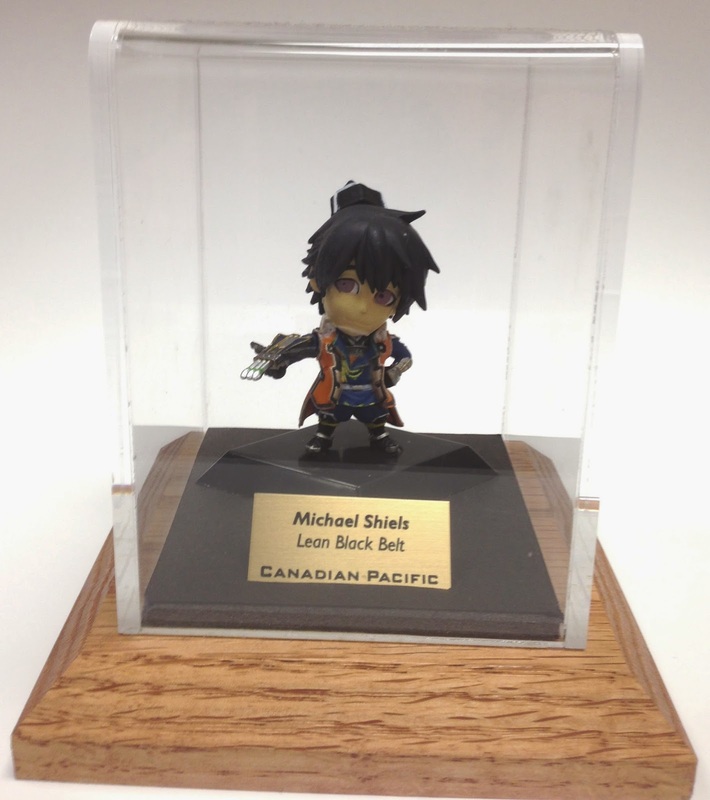 The chosen character is then sent to CP’s promotional products provider who makes a base and an acrylic cover, mounts the figurine inside along with an engraved plate with the person’s name and title of “CP Lean Blackbelt”. Then we plan a celebration to present both the framed certificate (signed by the President) and the special character. LEAN SENSEI: How does CP go about celebrating the full certification of a CP Lean Blackbelt, and how important is that celebration? JA: The celebration is extremely important and means a great deal to the individual. Each person can see the President has personally signed their certificate – that’s a clear statement of the value and respect of their work to the company. Each person also knows their peers have selected their figurine – a clear statement of camaraderie with and respect of their team mates. The purpose of a celebration is to share the story of that person’s accomplishment with their peer group and leaders who have all been through the same challenge. Then we recognize that accomplishment permanently through the certificate itself and the game figurine. Since we usually have our entire team together two or three times a year for business purposes, we use those times as opportunities to celebrate these accomplishments. Jeff Adams’ department was one of the very first at CP to take on this rigorous approach to making training stick. LEAN SENSEI: How has the response been to this approach back at CP, in the wider organization? JA: It’s being adopted in other ways across the organization when it comes to training – or perhaps a better way to say it would be that it’s being adopted in what happens after training. Training is only about 20% of the influence on successfully driving the behavior. The consequences are 80% : If the behaviours are supported and sustained and if they are reinforced, then people have begun to form new habits. This article is from our quarterly newsletter. For more tips, click here to subscribe to our newsletter.